Why I Love Valentine’s Day… Now! I’ve never really been a big fan of Valentine’s Day. For me it was just a marketing tool used to rake in thousands of dollars and convince millions of people to buy and eat large amounts of sugar…. commercialism at it’s best! 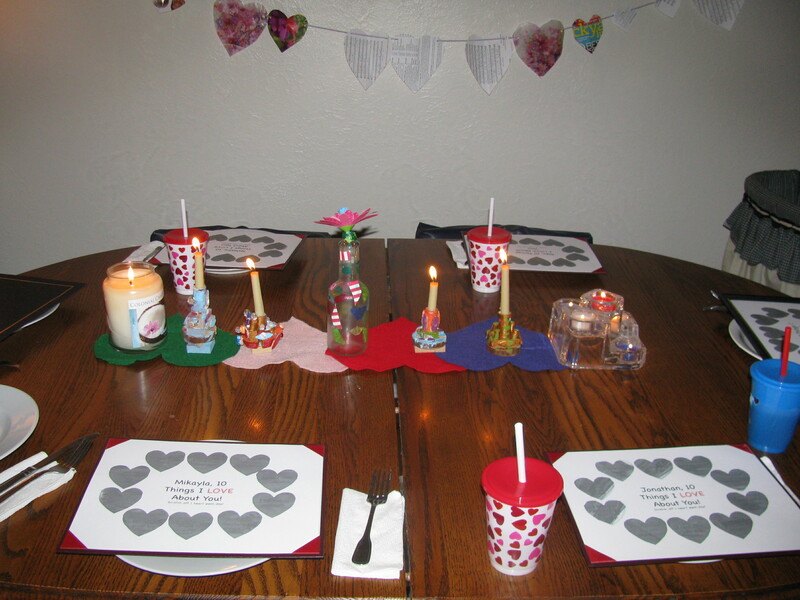 However, five years ago I started a new Valentine’s Day tradition with our family. A special evening where we focus on God’s love for us and the love we have for each other. I decorate our house with lots of hearts and bible verses that express God’s love for us. I usually make chicken cordon bleu because the entire family really likes it and then I make a special dessert. This year, dessert was VERY simple as being 37 weeks pregnant I’m low on energy! I bought gluten free pretzels and put a Hershey’s kiss on each one and popped them into the oven at 170 for about 5 minutes. Then I topped each one with a pink m&m. They were a huge hit. I also try to make something special for each family member. 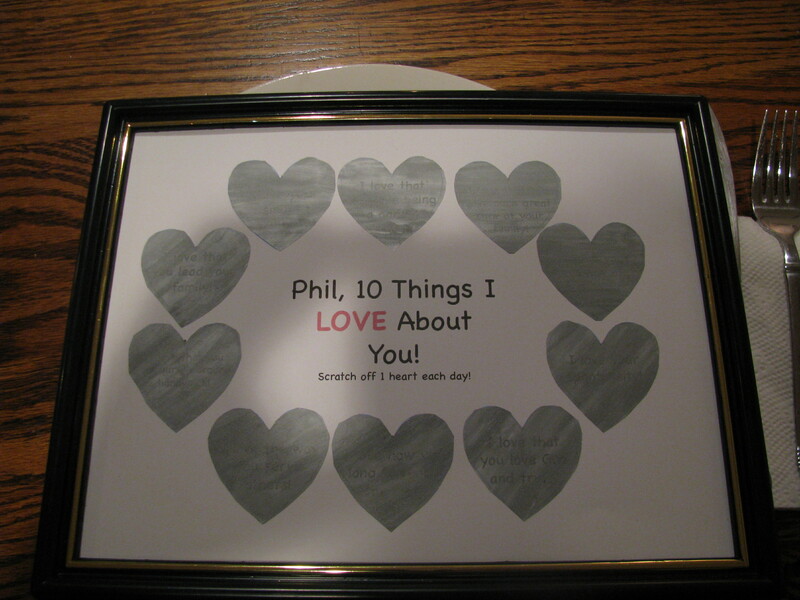 This year I made each person a presentation of 10 things I love about each one. Each night starting on Valentine’s Day everyone scratches a heart off to reveal one thing I love about them. We have all really enjoyed this nightly activity. Rather than give in to the commercial take on Valentine’s Day try making it a family devotional time and an opportunity to be a blessing to your family! As a homeschooling mom I often hear from those that don’t homeschool about the lack of socialization in homeschooling kids and it just makes me wonder how much time they actually spend with homeschooled kids. More then likely, it’s an issue they have heard about and assumed must be correct or they see some odd and rare example on the news or internet about a secluded homeschool family. Therefore, this must represent all homeschool families. The Homeschool Legal Defense Association (HSLDA) recently posted an article about a bill proposed in France to limit homeschooling rights to only those with physical or mental disabilities. All other students would be required to attend the government run public school. The main reason as stated by the Union for a Popular Movement is they believe homeschooling drastically limits socialization. I believe this reason is just an excuse because the government just wants control of what the kids in their country are taught. If they truly spent time with kids that have been homeschooled they would see that a vast majority of them actually have better social skills then those taught in the public school system. Eating lunch at a fast food place recently, an elderly woman had been sitting close by and as she was leaving she stopped to talk to the girls and said what a lovely family we have. There are all so pleasant. My mom has had many dentist appointments over the last 3 months at 3 different offices. I usually leave the 3 girls in the lobby while JT and I go back with my mom to talk to the dentist. Staff from all 3 offices have told me how pleasant my children are to be around and how they can be left alone in a lobby and they still behave without me close by. I’ve even been told by staff that when they see several children come they cringe inside because it’s usually not a pleasant experience for the staff or the other patients. As a family we got to a nursing home once and sometimes twice a month to sing songs and give hope and encouragement to the residents. My girls LOVE the day we go to the nursing home. Without any prompting from us they approach the residents and talk with them and show them love. Because my kids are together everyday they’ve learned to play with each other, learn together and encourage one another. If this is what non-public school socialization looks like then I’d say it’s more successful then the government controlled, lacking in morals, God denying public education system. Unfortunately, so many parents in our society say the typical attitude of children is just the way they are rather than maybe the way they are being raised. Children (especially teenagers) are given a pass because of hormones or puberty or whatever excuse the parents can come up with. It’s ok to not acknowledge an adult speaking to them, it’s ok not to show respect or be annoyed with those they just don’t want to take the time to talk to. Well… this is probably another post all by itself… maybe titled Teenage Years and It Doesn’t Have to Be as Bad as Society Says…. hmmm… I like it! I will take our homeschool socialization over public school socialization any day!